Hi John, Finished your book. It was great! Laughed like an idiot. I am not a golfer, so I'm passing it on to my golf friends who will love it as well as to my poor ignorant males friends who are oblivious to the female gender and how we are programed. Funny you reference Men are from Mars and Woman from Venus. I loved that book. Your stories had many emotions. I went from sad to happy, to thrilled, to laughing. I am a golfer so I read the back cover and decided to buy the book. It is an easy book to read that is hard to put down after you start reading. It was more than I expected. It was not just about golf but about relationships and interesting funny golf stories. Congratulations John on writing an enjoyable and positive book. I enjoyed the book in its entirety however Chapter 19 (Ken and Julie) brought tears to my eyes. What a special and rare true love they had. It is so rare that people find their soul mates. What a beautiful thing to fulfil her wishes to have her ashes spread over 14 of their favorite places around the world. I can only imagine the experiences and the memories that each of those special areas must bring back. I am going to go work on my golf game and my personal and work relationships. I have been a professional narrator for many years. I have read wonderful stories for many brilliant authors. Since I do warm reading, on rare occasions I must break from the booth to recompose myself after reading a Chapter. Such was the case with The Golf Pro Has Heart which made me constantly think as he shared relationship secrets few have ever heard, entertained with stories that range from humorous to emotion filled. Part way through the book, I felt compelled to call John and thank him for the opportunity to be a part of such a unique book. He drew me in holding me to the end as each Chapter was unlike the previous. I can not imagine anyone not appreciating this read. I tried to do my best to reveal its inner secrets to you in the audio version. This is one of the best I have ever read. 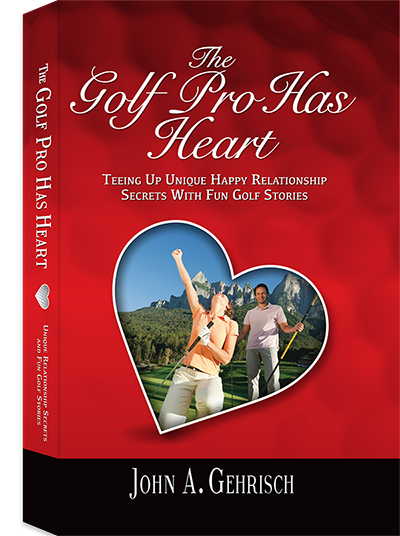 "A wonderful perspective on finding love and happiness peppered throughout clever, short golf narratives. A thought provoking and entertaining read that I didn't want to put down." "A must read for anyone thinking of having a relationship of any kind if you want it to be good. I loved this book. Starts a little slow, then gets better and better and better as he builds the foundation as he puts it. I learned so much about relationships. I can see how men and woman would benefit in a huge way from the secrets you never hear about here. I do not play golf, but I actually loved the golf stories, because they get into things unrelated. Some of the pranks are hysterical. I hope this comes out in audio. I want to listen in my car again as I go to work." "I must admit, since I do not play golf, I was not sure how I would like it. But to my surprise, I loved it. I felt it started a little slow, but I stayed with it, and I am so glad I did. I learned a TON!! So many things I never thought about before that makes so much sense, and a lot I did not know. I actually enjoyed the golf parts, because most turned out to be stories, pranks, and jokes played by world class golfer most anyone would recognize. I have to say, I want to read it again. I will be a better partner for my girl going forward now. I am excited to bring more to our relationship in the future, but even more important maybe, is I will understand her better now. Maybe it is not completely true that men will never understand woman. Maybe woman can actually understand us also. The keys are presented. I think I get it now. I wish I could listen to this on audio. I hope he comes out with that. If you are reading John, I will buy that also if you will make it available. Thanks so much for sharing all this!" Copyright © 2017 John A. Gehrisch, All Rights Reserved.